Like so many other artists when Darren started out his parents weren’t behind a career in the arts. He ended up going to university and studied computer science and business. He began honing his art skills while working for a local grocery shop where they had him designing ads and flyers and he used his spare time there to push his Photoshop skills further. For the past year, Darren has been working on his new project. It’s called ‘The Nomad’ and it’s a satchel built specifically for artists, especially those artists that like to sketch outdoors. When we recorded this episode Darren was right in the middle of his Kickstarter Launch and he’d already been funded within the first few days. There’s a lot of reasons the Nomad makes sense for artists. 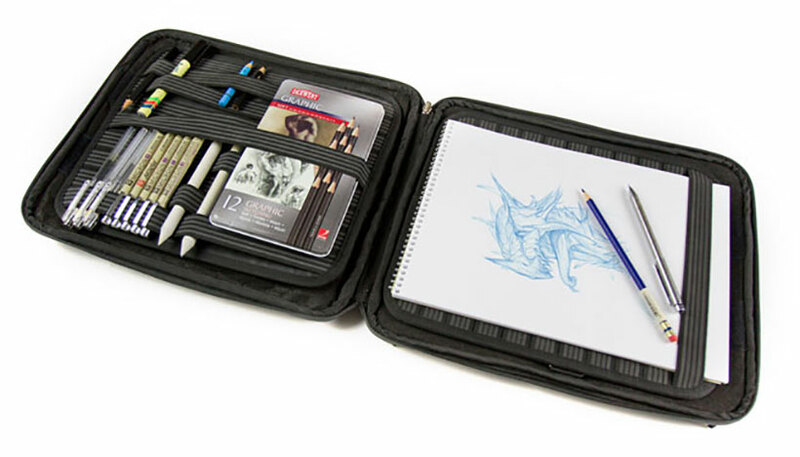 It quick to get at your tools, it can hold pretty much any sized sketch book or tablet easily, the adjustable straps make keeping your pencils and pens from getting lost in the bag and it also has a tripod attachment so it’s perfect for doing longer sketching sessions. Perhaps the biggest innovation is the adjustable shoulder strap that once you adjust it allows the bag to balance on you hip and makes the perfect on-the-go sketching surface. While Darren was creating this bag he met with roadblocks just like any artist trying to create something new. The process wasn’t easy by any means, and he also invested thousands of dollars to take the idea from the initial concept to the product that you can now buy today. How Did Darren Stay Focused and Motivated? In order to keep moving ahead with forward momentum with his bags Darren hired a business coach that he met with once a month to help him stay focused on what was important and keep pushing his project forward.